Camille Witt et Claire Tadeo. Sentences using si have two parts. 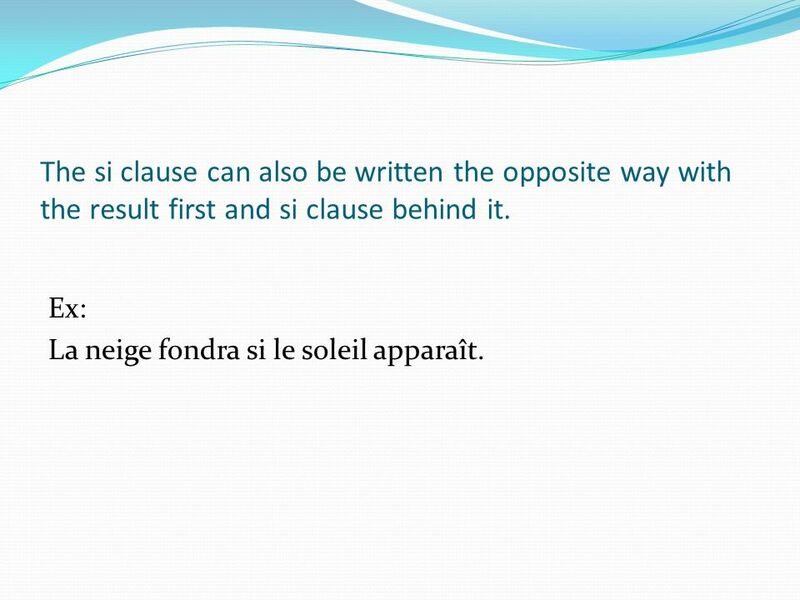 One clause stating a condition or possibility, and a second clause naming a result depending. 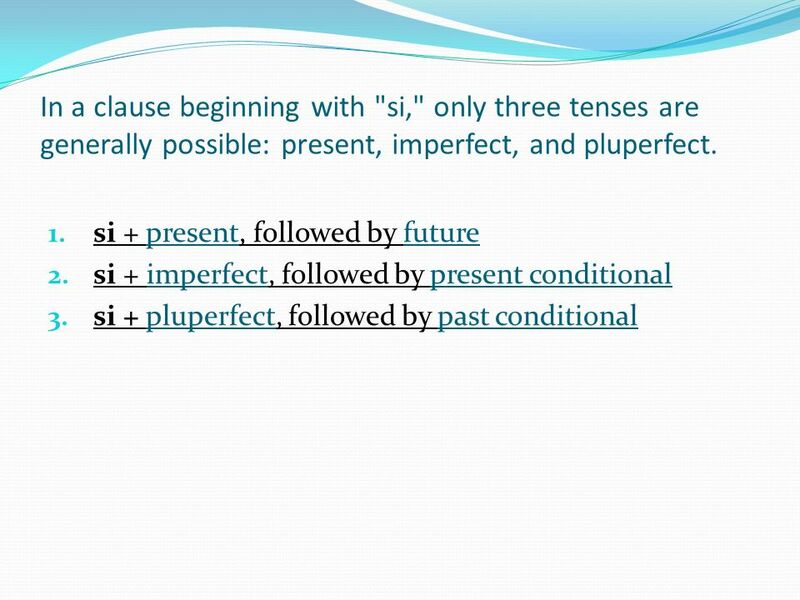 3 The si clause can also be written the opposite way with the result first and si clause behind it. Ex: La neige fondra si le soleil apparaît. 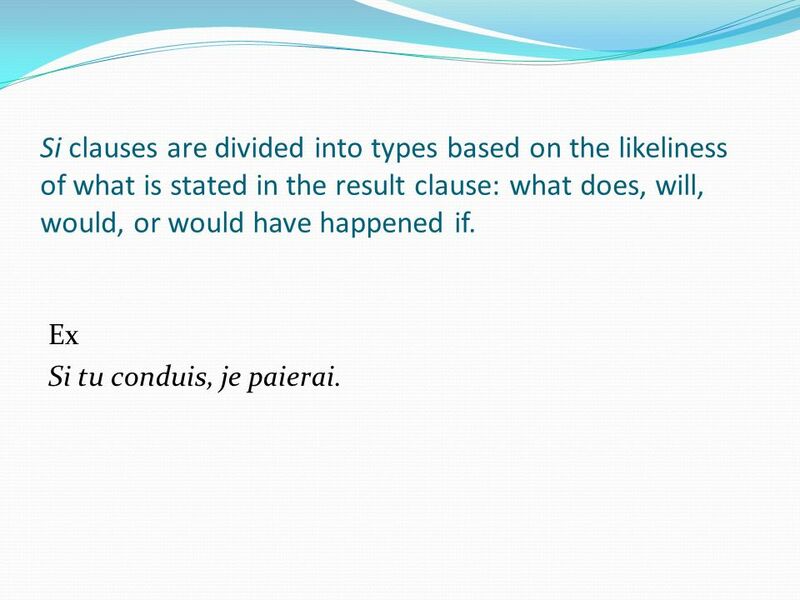 5 Si clauses are divided into types based on the likeliness of what is stated in the result clause: what does, will, would, or would have happened if. Ex Si tu conduis, je paierai. 6 This construction is used to give an order that is dependent on something. The present follows si; it is the situation that is required before the other action becomes a command. 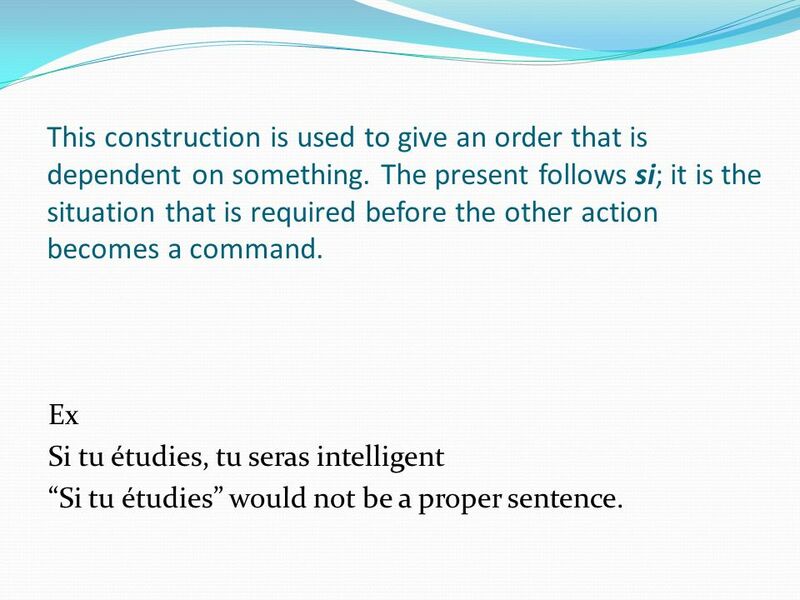 Ex Si tu étudies, tu seras intelligent Si tu étudies would not be a proper sentence. 7 Examples Si j'étais riche, j'achèterais une maison. Si tu peux, viens me voir. Si javais le temps, je le ferais. 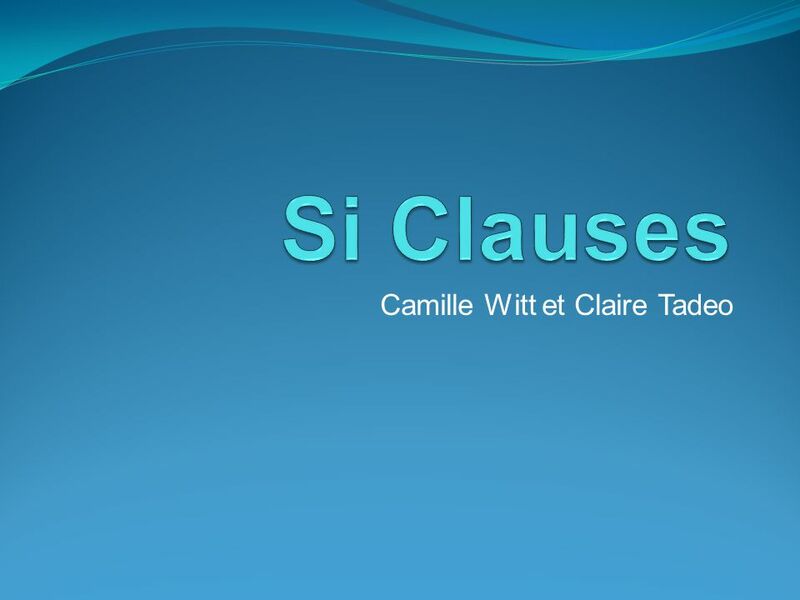 Download ppt "Camille Witt et Claire Tadeo. Sentences using si have two parts. 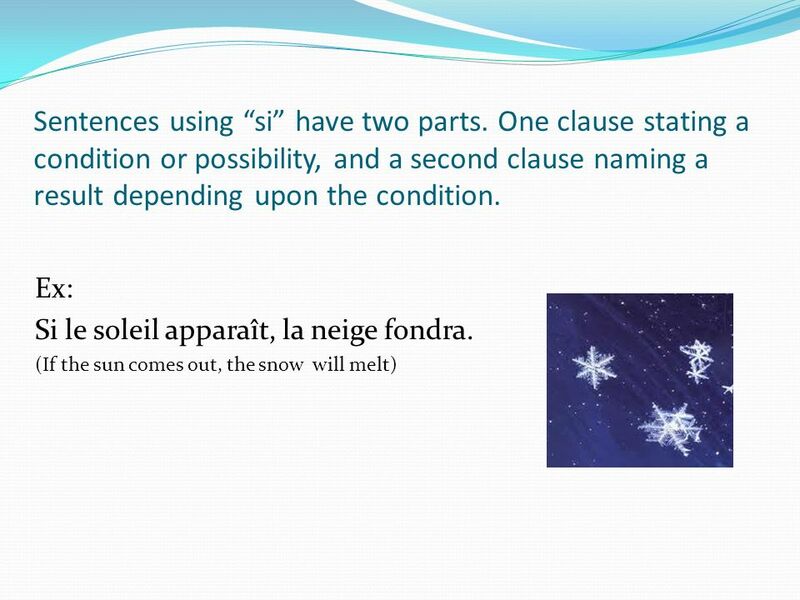 One clause stating a condition or possibility, and a second clause naming a result depending." More Usages of the Subjunctive Tense Sp. 3 H c.7. Louisiane, Louisiane! Quest-ce que tu vois?. Je vois le PÉLICAN qui me regarde. PRÉPOSITIONS AVEC LE TEMPS POUR, DANS, et EN. REVIEW Depuis means "since" or "for." 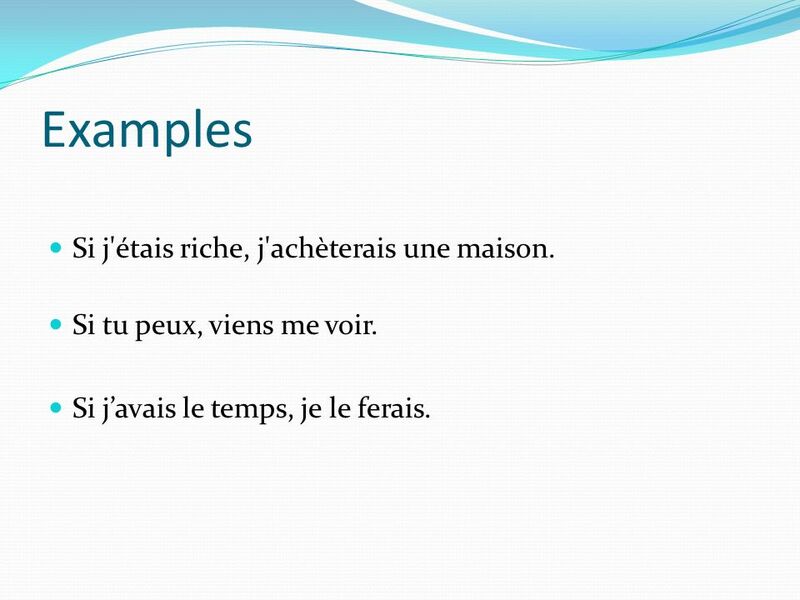 It is used with a French verb in the present tense to talk about an. To describe an action that was in the process of taking place, e.g. I was watchingje regardais She was listeningelle écoutait We were talkingnous parlions.